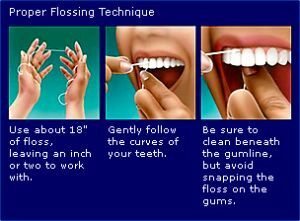 Brushing and flossing help control the plaque and bacteria that cause dental disease. Plaque is a colorless sticky film of food debris, bacteria, and saliva that sticks to the teeth and gums. The bacteria in plaque convert certain food particles into acids that cause tooth decay. Also, if plaque is not removed, it turns into harder deposits called calculus (tartar). If plaque and calculus are not removed, they begin to destroy the gums and bone, causing periodontal (gum) disease.Plaque formation and growth is continuous and can only be controlled by regular brushing, flossing, and the use of other dental aids. 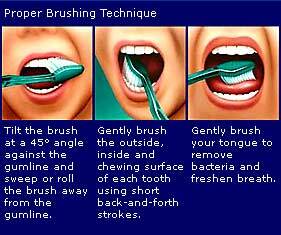 • Brushing technique: Brush at a 45 degree angle to the gums, gently using a small, circular motion, ensuring that you always feel the bristles on the gums. Nowadays disposible floss with holders are also available. Ask your dentist about this.